During the First Balkan War, the armies of the Balkan League—Bulgaria, Serbia, Greece, and Montenegro—scored victory after victory against the ailing Ottoman Empire, until Turkish troops were isolated in a handful of fortified cities. About 20 miles west of the Ottoman capital Constantinople, the Turks dug in for a last stand at Chataldzha (Catalca), where they fended off repeated Bulgarian assaults. 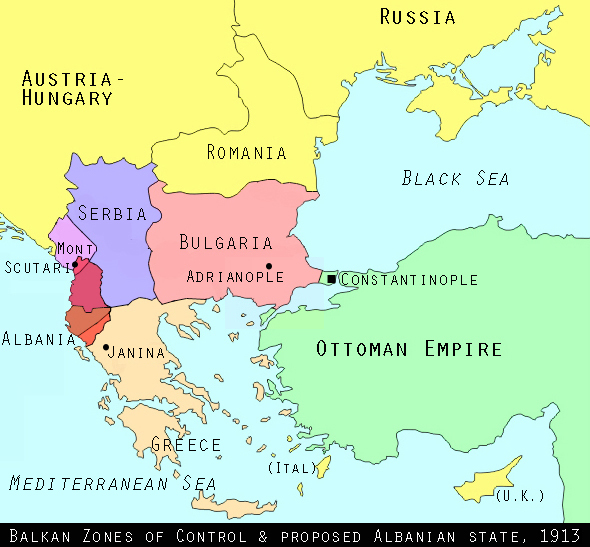 Elsewhere in the Balkans, Scutari (Shkodër) was besieged by Montenegrin and Serbian forces, despite threats from Austria-Hungary’s foreign minister, Count Berchtold, who wanted the city to be part of the new independent state of Albania. And to the south, a small Turkish garrison held out in Janina (Ioannina) until March 6, when the city finally fell to a massed assault by Greek forces. But the most important city still in Turkish possession in March 1913 was Adrianople (Edirne), in Thrace. In addition to its strategic position on the way to Constantinople and the Turkish straits, Adrianople had cultural and sentimental significance for the Turks: After Sultan Murad I captured the city in 1365, Adrianople served as the Ottomans’ European capital until the fall of Constantinople in 1453, and contains treasures of art and architecture including the Selimiye Mosque, designed by the architect Mimar Sinan in the late 16th century. Of course the ancient city—called the “most contested spot on the globe” by military historian John Keegan—was also important to the Bulgarians, who remembered it as the site of numerous clashes between the medieval Bulgarians and Byzantines as well a great Bulgarian victory over marauding Crusaders in 1205. 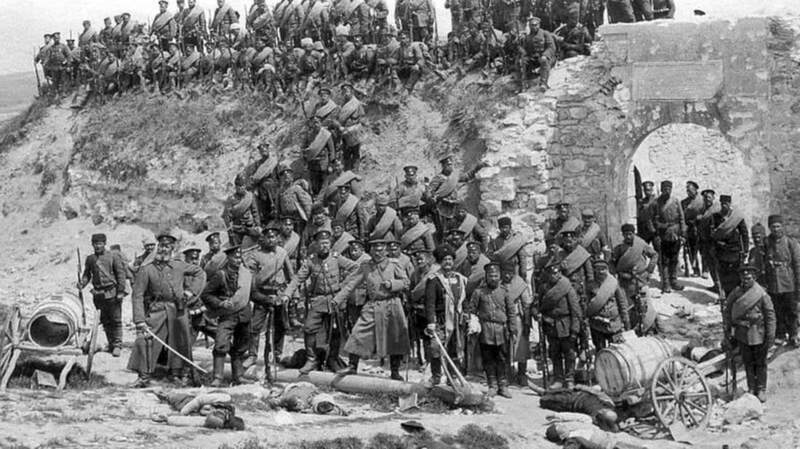 After defeating the Turks at Kirk Kilisse in October 1912, a Bulgarian force of 100,000 (later joined by 50,000 Serbs) laid siege to Adrianople, but repeated assaults were frustrated by 75,000 tenacious Turkish defenders, dug in behind German-designed fortifications that were widely considered impregnable. So determined were nationalist Turkish officers not to give up Adrianople that, when the Ottoman government in Constantinople agreed to surrender the city during peace negotiations, officers from the Committee of Union and Progress—CUP, better known as the “Young Turks”—overthrew the government in a coup on January 23, 1913, killing war minister Nazim Pasha in the process. By March 1913, morale was plunging among the Bulgarians, who were low on supplies, exposed to the elements, and weakened by typhus and cholera. The Bulgarian commander, General Mihail Savov, knew that time was running out for a successful assault. The arrival of Serbian reinforcements—especially Serbian heavy artillery—in February helped Savov decide in favor of attack. The order was given on March 23, and the battle began the next day. At 1 p.m. on March 24, 1913, the ground shook and the sky flashed as Bulgarian and Serbian artillery poured thousands of shells on Adrianople’s defenses. As this withering barrage reached its climax in the early morning of March 25, waves of Bulgarian and Serbian troops advanced towards Turkish lines to the south of the city. Fierce fighting continued until noon on March 25, resulting in heavy casualties—but the southern attack was actually just a feint, intended to draw Turkish troops away from the city’s eastern defenses. This elaborate ruse succeeded and the main assault from the east began around 3:50 a.m. on March 25. Within a few hours Bulgarian and Serbian troops had broken through barbed wire and trenches to capture the outer ring of Turkish defenses, reaching the inner ring by 1:50 a.m. on March 26. Turkish units now began to surrender en masse, and by 9 a.m. Bulgarian cavalry had penetrated into the city itself. At 1 p.m. on March 26, 1913, the Ottoman commander, Mehmet Şükrü Pasha, formally surrendered to the Bulgarians. The loss of Adrianople was the final indignity for Turkish nationalists already humiliated and enraged by the loss of the Ottoman Empire’s Balkan territories. Public opinion was further inflamed by the arrival of around 400,000 Turkish and Albanian Muslim refugees from the Balkans, telling of horrible atrocities by Christian troops. And the situation was only getting worse: On March 26, 1913, the very day Adrianople fell, the Ottoman government was forced by Europe’s Great Powers to pass a law giving more autonomy to six provinces in eastern Anatolia with big minority (in some cases, majority) populations, including Armenians and Kurds. Supposedly passed on humanitarian grounds, these de-centralizing measures cleared the way for Russia’s devious plan to extend its influence in the region, with an eye to outright annexation. As a result, the Ottoman Empire’s minorities—particularly the Armenians and Greeks—were viewed with growing distrust by Turkish nationalists, who feared they were unreliable and possibly even agents of foreign powers like Russia. This would have terrible consequences in the coming Great War, when the Ottoman government committed genocide against Armenians and Greeks. The sudden upsurge of Turkish nationalist feeling was reflected in the publication of scores of pamphlets, books, journals, and newspaper columns calling for a Turkish “awakening.” Citing the recent military defeats as well as the empire’s inept administration, poor educational system and economic backwardness, Turkish nationalists called for wide-ranging reforms, indeed the creation of a “new society” or “new life.” Otherwise, they warned, the European imperialists would carve up the Turkish heartland in Anatolia. See the previous installment, next installment, or all entries.